As the name suggests, Hot Rods are the name of the game here. Each year Brooklin models will select six models to be customised and rodded. These models are not caricatures. Although customised, body design reflects the original subject vehicle accurately. THE ROD 43rd RANGE HAVE NOW BEEN DISCONTINUED. SOME STOCK STILL AVAILABLE. 1952 Muntz Jet from the ROD 43rd Models Collection. The Muntz sits on 10 spoke custom wheels with disc brake detail. The car runs a lowered hide height, quad exhaust pipes and a custom Rear cover panel. The paint finish is Raven black. 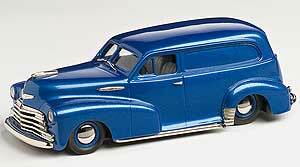 1947 Chevrolet Stylemaster Sedan Delivery from the ROD 43rd Models Collection. 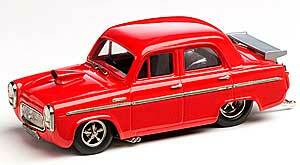 1955 Ford Prefect from the ROD 43rd Models Collection.